We've been practising for the 11+ exams over here at Talk-a-Lot Towers, and I can't exactly say that it's been a bag of laughs ... .
To keep hold of my sanity I've been playing around with some of my Merino double knitting, trying to make a good-luck mascot for the big day. 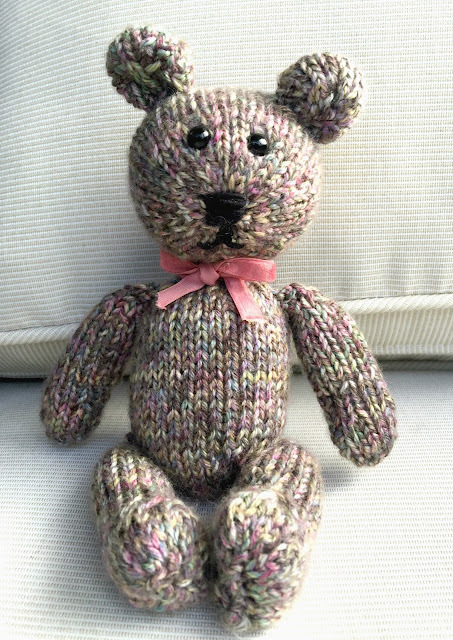 The idea was to create a teddy bear in this lovely tweedy wool, but do you know what happens when you make your teddy's eyes too close together ... he morphs into a Teddy Mouse! Anyway the pattern's a work in progress, and were he given a voice to reply he'd probably quote Marilyn Monroe and tell us: Imperfection is beauty, madness is genius and it's always better to be absolutely ridiculous than absolutely boring. And his name is ... Dave. Not sure why, but it's definitely Dave. All the best for now, and happy All Saints' Day!